The World renowned ranking organization, Forbes, has released its list of richest people in Nigeria for 2017. Aliko Dangote is the richest man in Nigeria, Africa and of course the richest black man in the world. In 2014, he ranked as the 24th richest man in the world but has since then fallen to positions below 100 due to Nigeria’s poor Naira. 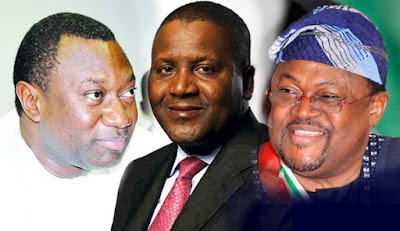 Mike Adenuga is the second richest man in Nigeria with interest in Oil and Gas and telecoms. He is the owner of Globacom, Nigeria’s second biggest telecom operators and the chairman of Conoil. He is the CEO of Zenon Oil and Gas and Forte Oil Plc. He has interest in real estates amongst other sectors. Folorunsho is a business tycoon who has interest in fashion,oil and printing industries. She is the richest Woman in Nigeria and the richest woman of the African descent in the world. Former Nigerian Chief of Army staff between 1975 to 1979. He is the current chairman of Athlantic Petroleum. Abdusalam is the founder of the famous BUA Group. A conglomerate active in sugar refining, cement production, real estate and port operations. In September 2015, his Group signed a $600 million deal with a chinease cement equipment service provider Sinoma Internation Engineering to construct a second production line located in Edo State Niger Delta, Nigeria. A philanthropist and founder of the Transcorp and Heirs Holdings. He was the chairman of United Bank for Africa. The former governor of Abia State. He is the founder and chairman of Slok Holding. A conglomerate with interest in shipping, banking, oil, trading, manufacturing and the media. He became a real business man at the age of 19 after being expelled from a Nigerian University for allegedly spearheading a series of student riots. Jim Oviah is the founder of Zenith Bank. He is the chairman and the largest shareholder with a stake of almost 10%. He also manages a mobile telecom Visafone which has over 3 million subscribers. Oba Otudeko is the Chairman and founder of the honey well group. He is also the chairman of FBN Holdings Plc. His operations spread across oil and gas, flour minning, real estate, and marine transportation.